India wellness centers have taken luxury spas and medical tourism to the next level. It's at a wellness center that you'll be able to pursue holistic physical, emotional and spiritual healing. You'll find most of these centers in southern India, particularly in the states of Goa, Kerala and Karnataka. This article highlights the best ones and what they offer. If you want a yoga-based treatment regime, but would prefer a luxurious environment rather than one of the ashrams in India, then Shreyas is the place for you! This boutique resort, situated 35 kilometers from Bangalore, has been modeled on some of the more exclusive hotels in Asia. There are just 12 rooms, spread across 25 acres of gardens. The aim there is to take guests on a journey of self discovery, to harness and purifying body and mind energies, and give a spiritual perspective to actions and emotions. It's achieved through classical Hatha yoga (postures), pranayama (breathing) and pratyahara (meditation) processes drawn from the Yoga Sutras. In addition, guests can participate in nature-based and community-based activities. These include spending time in the fields, preparing meals for children at the local orphanage, and visiting local villages. If you want to relax, Shreyas has walking tracks, outdoor swimming pool, spa, home theater, and library. Cost: Nightly rates start from $280 during the low season (April to the end of September) for a single garden tent or poolside cottage. All meals and activities are included. Taxes are additional, and these add up to around 27%. Package rates are available as well, starting from $1,060 for a 3 night Wellness for the Soul package, plus tax. Read reviews and compare prices on Tripadvisor. Vana Malsi Estate opened in early 2014. It's often likened to a luxury ashram, where guests are referred to as Vanavasis, as there certain guidelines and restrictions that must be followed. Bespoke immersive programs are curated for each guest based on various objectives from de-stressing to weight management. Treatments include Ayurveda, Sowa Rigpa (Tibetan healing), yoga, natural therapies (such as acupuncture), spa therapies (such as massages and scrubs), fitness, and aqua therapies. Wellness cuisine, daily guided meditation, nutritional cooking lessons, music performances, herb and vegetable gardens, and fruit orchards are all part of the retreat. Guests are also encouraged to plan their own diet. There's a minimum stay of seven nights. Cost: From around $800 per night for two people, including all meals, daily treatments and transfers. SwaSwara is located at one of India's best beach destinations, Gokarna in Karnataka. The resort's aim is to help you connect with your body and soul. "Swa" in Sanskrit means "the self", and "Swara" refers to sound. What's unique here is that the resort is one of the top art hotels in India -- it has an Artist in Resident program, so you can explore yourself through creativity. Sunrise yoga on the beach, meditation, and Ayurvedic treatments are also provided. The resort is more liberal than most wellness centers, as it offers wine with meals. However, meat (apart from fish) is not served. Accommodations are provided in 24 Konkan villas. Guests must stay for a minimum of five nights, with seven nights being recommended. Cost: Fully inclusive Ayurveda packages start from about $1,650 for seven nights. This is the cheapest rate during the monsoon season, from May to October. Read reviews and compare prices on Tripadvisor. One of the newest wellness centers in India, AyurYoga Eco Ashram stands out for its unique approach of applying yoga and Ayurveda in a practical way for today's modern world. Rather than focusing on asanas (postures), the aim is to offer an authentic and traditional understanding how yoga and meditation can be used in daily life. The programs and retreats are ideal for those who are looking for long-term lifestyle changes to mind and body. Yoga Teacher Training is provided as well. The ashram is non-religious. Rather, guests are encouraged to learn from various spiritual traditions in India. It's located on an 18 acre organic farm and sacred forest on the banks of the Kabini River near Mysore -- a perfect environment for healing! There are four yoga spaces in nature, a traditional Ayurvedic hospital with doctors from Kerala, 40 comfortable eco-friendly guest rooms, and healthy vegetarian food. Cost: A fully-inclusive 14-day yoga retreat for beginners is $800 per person twin share, or $1,000 for a private single room. For intermediate and advanced levels, the price is $1,000 per person twin share, or $1,200 for a private single room. Customized Ayurveda treatment packages start from $800 per person twin share, or $1,000 for a private single room, for seven days and longer. Cost: From around 13,000 rupees ($200) per night for single occupancy. It includes accommodations, food, medicine, cultural entertainment, and use of all facilities such as gym and library. Special packages are offered. Read reviews and compare prices on Tripadvisor. Cost: Rates start from 2,500 rupees ($40) per night, for a standard room. Three meals a day costs 1,000 rupees. A session of yoga is 300 rupees. Ayurvedic treatments start from around 1,500 rupees each. Alternatively, a range of packages is available. Rates start from $180 per person for a one night package. Expect to pay $1,050 upwards for a seven-night rejuvenation package. This is fully inclusive of accommodation, food, doctor's consultation, treatments, and yoga. Read reviews and compare prices on Tripadvisor. Soukya advertises itself as the first holistic health center of its kind in the world. What does this mean? Simply that Soukya offers an extensive range of systems of medicine and therapies all under one roof. These include Ayurveda, homeopathy, naturopathy, yoga, acupuncture, reflexology, and acupressure. The center's name comes from the Sanskrit word 'Soukhyam', which means well being and a harmonious state of the mind, body, and spirit. It's owned and operated by a doctor who's been in the holistic health medical practice for over 20 years, and all programs are monitored by qualified doctors and therapists in each specialty. The center consists of 25 rooms on a 30-acre organic farm in the countryside. There is a yoga and meditation hall, recreational facilities, and a long walking/jogging track. Cost: There are different prices for foreigners and Indians (who are residents of India). Room rates start from $260 per night for a single deluxe room. Indians pay 11,900 rupees per night upwards. Food and yoga are included but treatments are additional. Wellness programs, ranging in length from seven to 28 days, are available from $200 a day for foreigners and 8,850 rupees for Indians. Read reviews on Tripadvisor. 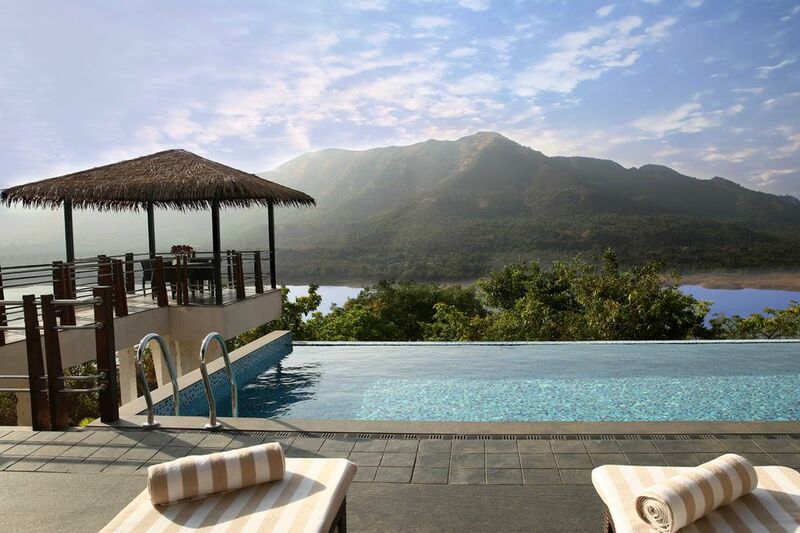 Nestled into the Sahyadri Mountains about 4 hours drive from Mumbai, Atmantan Wellness Resort has a view to die for overlooking Mulshi Lake. It aims to empower guests to transform their lives through education and lifestyle modifications targeting body, mind, and soul. Atmantan's team of qualified experts prepare individual wellness formulas according to guest requirements. A holistic integrative approach is taken, combining Ayurveda, Naturopathy, Yoga, meditation, functional fitness, and nutrition. Various wellness packages are offered including healthy living, cleansing, weight control, and restorative physiotherapy. Cost: A minimum 3-night stay is required. Prices depend on the category of accommodations chosen and start from around $1,700 for a single or $2,500 for a.double. This includes all meals and therapies. Tax is additional. Detailed information is available online. Nimba Nature Cure Village was founded in 2014 and is the largest center for naturopathy, Ayurveda, yoga, meditation and physiotherapy in western India. It's conveniently spread over 50 acres of lush grounds approximately 30 miles from Ahmedabad on the Ahmedabad–Mehsana Highway. The name "Nimba" comes from the Sanskrit term Nimbati Syasthyamdadati’, which means to give good health. Nearly all ailments are treated by the in-house team of doctors and therapists. Residential programs range from stress management (3-5 days) to anti-aging (21-25 days). However, staying at the center requires discipline, as a daily wellness schedule and diet need to be followed. Cost: There are different prices for foreigners and Indians (who are residents of India). Rates start from $120 per day per person for foreigners, and 6,000 rupees for Indians. This includes all consultations, treatment, meals, use of facilities, and accommodations. Read reviews on Tripadvisor. Kerala is considered to be the home of Ayurveda. The moist, humid climate and abundant supply of medicinal plants provide the perfect environment for the many Ayurvedic resorts there. These top resorts are all well managed and have an excellent range of properly administered Ayurvedic treatments. They suit a range of budgets, from basic to luxury. Goa is a popular place for yoga retreats, and many focus on holistic wellness by providing Ayurvedic treatments and other natural therapies as well. Most are located in north Goa and are generally open from October to May each year. India's award-winning destination spas and resort spas, located across the country, are not just about pampering. Many offer extensive wellness programs with various focuses including stress management, weight loss, and detoxification.